This is the first video review in a series reviewing the Saddleback Leather Squared Backpack. The text below is the transcript of the video. You can see/read episode here two here. Hi folks! This is TJ with Best Leather and for this review I’m going to do something a little bit different. I received a Saddleback Squared Backpack. Saddleback sent me one to review and I think I’m going to do some videos and walk you through what it looks like to live with it, to use it frequently, the pros and the cons—there are always cons when you’re buying something this expensive. Hopefully it will give you a really good understanding of why you’d want to spend so much money, nearly $600, on an item like this, or you wouldn’t. 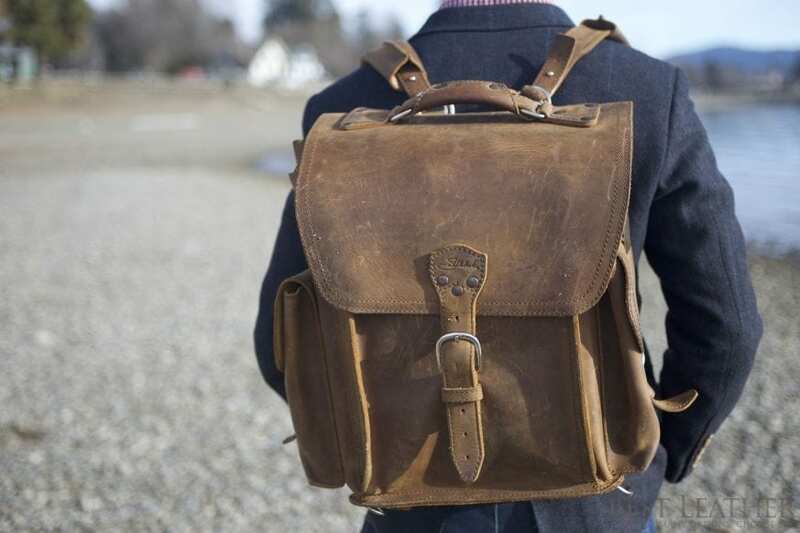 So this is also a backpack with the new tobacco leather and there’s been some controversy as to the quality of the leather and whether or not Saddleback is saving money and not passing those costs onto consumers. So we’ll also take a look at the quality and see how that stacks up against some of the older stuff. I have access to a Tank Backpack, Saddleback’s classic backpack, and will be able to compare it there. So let’s dive in. This is the Saddleback Squared Backpack and I want to go through and show you guys a few details on it. This backpack retails for $582 and I’ll show you some of the features and reasons why it’s quite so expensive. 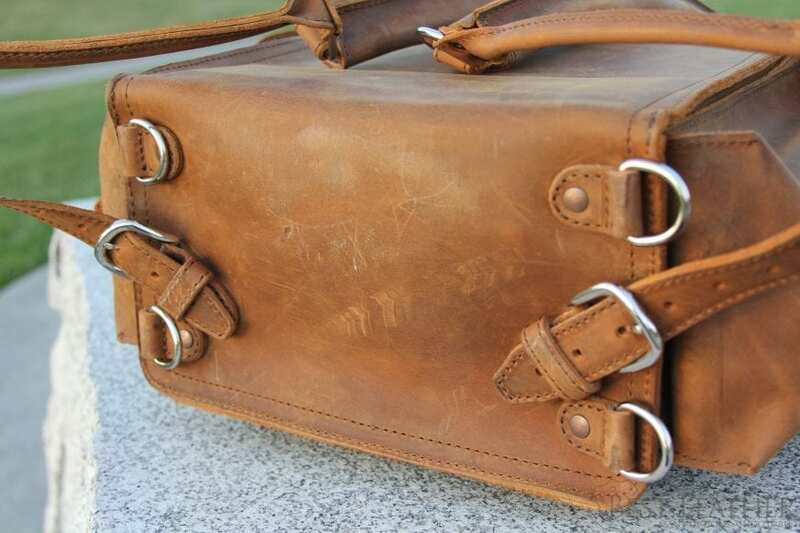 The classic backpack was actually what got me into Saddleback leather and quality leather products elsewhere. I had a friend who had one and I couldn’t believe that it was $600. The more I researched into it, the more I realized it cost a lot to make these bags. I think there’s—maybe this is a little bit of a guesstimate – 12 square feet of leather here. If you are looking at leather prices, you could be spending $100 just on leather, not to mention hardware and the time to make it. These people have to be craftsmen because there’s a very high level of precision required for leather working. You don’t want to waste this leather. So let’s go into some of the details on this. I’ve had this backpack for two days now and so far it’s been a very enjoyable process. The first thing I want to show you is the straps. Now these straps are different than the Saddleback classic backpack straps. A little bit different design there. I’ll show a picture of the old straps there. The problems that they had was they were very thick, they were very padded and they would scrunch up so you can see how it’s scrunched up there. You’ll notice that those bumps there can get really uncomfortable. It’s worse on the old one. So that’s nice. Those are pretty comfortable straps, surprisingly. The first day that I was using it I was kind of stretching it and twisting with my hands to help it break in a little bit quicker, but it’s been very comfortable so far. Another aspect that’s helping the comfort, as opposed to the tank, the classic backpack, is right here there was a seam. That seam would irritate your lower back if you wore it quite a bit and people would get pretty severe chaffing. So this is actually one piece of leather that just goes right around that corner. And that has not posed a problem whatsoever. Now I haven’t worn this for an extended period of time. I’m going to try and do some hiking with it. I’ll go out with 4 or 5 hours and see what kind of issues may come up but so far I’m really enjoying the straps. 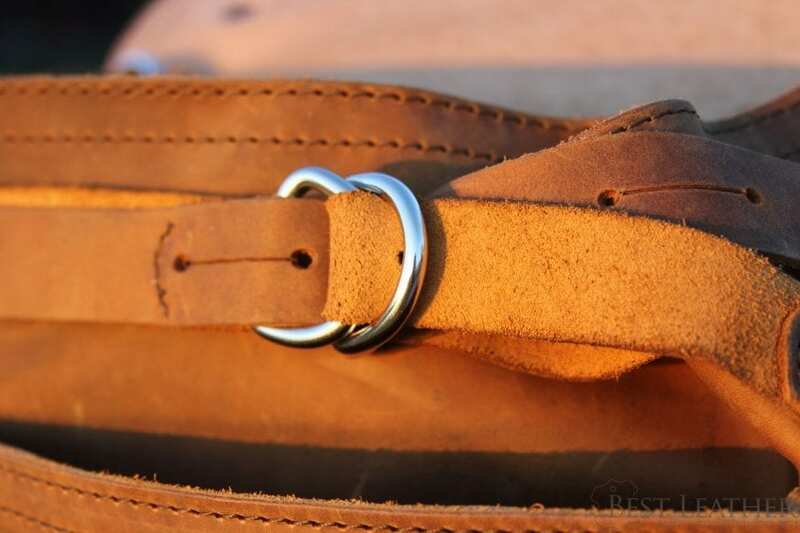 Another detail on the straps is the flexibility and how easy it is to change the strap sizes. So on the old one there was all sorts of straps to undo, one strap that was very long and you’d end up with—if this is the old one you’d have layers and layers and layers of strap, a lot of extra weight. So they’ve really trimmed that down. These are very easy to change and adjust. It took me about 10 seconds to get it right for my size. So definitely the shoulder straps are very nice. I haven’t noticed any problems with them at all. So the next thing, the elephant in the room for some people, is the new leather. This is the new tobacco leather. You’ll notice if I do a close-up here that it comes with kind of a patina. Now I like this. 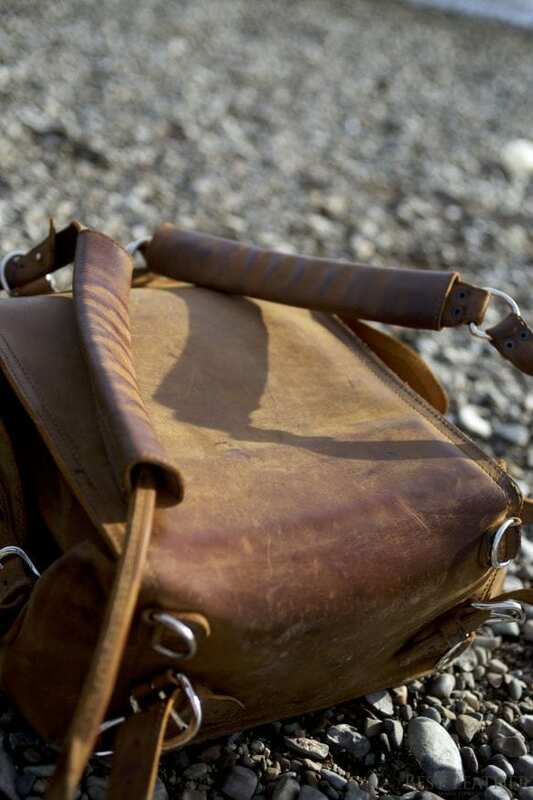 I like this patina because as much as the backpack looks used, it’s still in very good condition. The leather is just as strong as it’s ever been. I don’t notice any things that I would consider blemishes—deep scarring or anything like that. It’s just unique. You see stuff in leather that I think you should see. It’s not one mass-produced product and I kind of felt like the older leather that they were using; it looked like it had been coated in plastic. It didn’t feel that great. Well their tobacco was just kind of a muted yellow color. So this is kind of a more true tobacco and I quite like it. Now like I said, there are no scars. Part of the controversy is that scars are decreasing the value of the product and Saddleback isn’t lowering the price of their products. I don’t think I can speak to that because I haven’t seen any scarring or anything on this. So maybe in another product we’ll get to check that out. But I’d say as far as the quality of the leather goes, it’s top notch. However, when I first got it, you’ll notice there are some spots here. Those are actually bug bites but when I first got them I thought, “Oh boy. This backpack has had water damage.” It hasn’t. These are just bug bites but it is something to note. 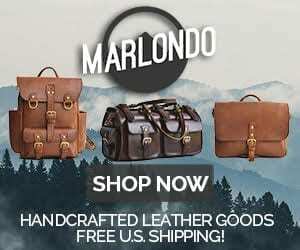 If you’re looking to have a leather product that doesn’t have a unique character to it in the leather, something like the old tobacco, then you’re better served by going on e-bay or going on one of the Facebook pages and buying one on there. You can buy some really great, lightly used, older tobacco-colored leather. It pretty much looks immaculate when it comes. It takes quite a bit to wear it in. This looks very nice. I really enjoy this leather. So the last thing I wanted to talk about here was the pockets. Now when it comes to backpacks, Saddleback is I think one of the best in terms of options. You’ve got a lot of pockets. You’ve got 7 pockets total. You’ve got this one here and a matching one on the other side. This front pocket here will hold a small laptop. I don’t think I can get this off of my hand. There we go. Alright. So we’ve got this front pocket here and that will fit an 11” laptop, maybe a 12” and a mouse pad. That one’s from Urban Cow on Etsy. They did a great job with that. So you’ve got a lot of pockets. You’ve got one, two, three, four interior pockets. And I like this because you can really use this usably, every day. 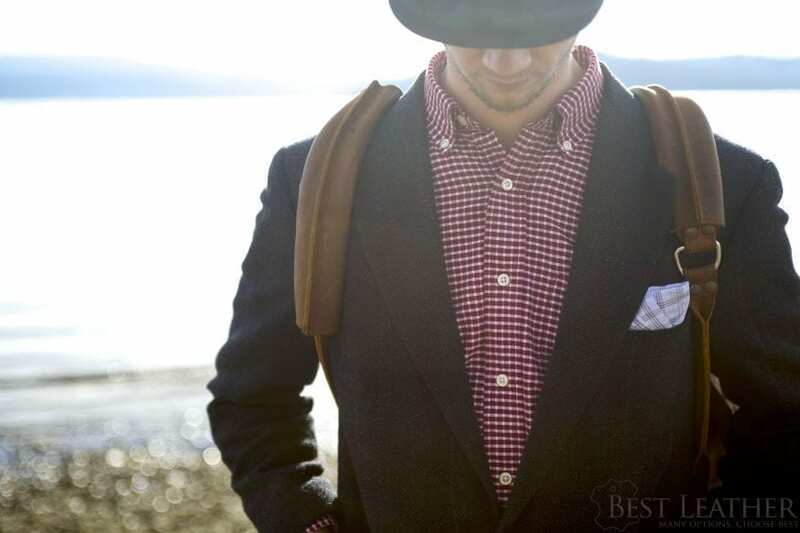 So if you’re going to class or you’re going to work and you’re looking for something that has a lot of class, a lot of style and is going to last a long time looking good, this is a good option. I should also mention the pigskin. This is very interesting pigskin compared to what it was. It used to be very dark and I thought it looked rather inorganic. I think it had been treated, died, most likely. But this has a very nice, soft feeling to it. It’s not very rigid like the older pigskin. And I very much like it. You can see little spots, not only the hair spots. I’ll try to fix it so you can see there that there’s some little hair spots where it’s been de-haired but if we look carefully we can find a bit of scarring. I don’t know. I can’t tell if that’s a scar or not but there are slight, minor issues but that’s what happens when you work with leather and animals that run into fences and whatnot. You can see we’ve got lots of rivets everywhere. I don’t know if you’ve ever tried to tear leather that’s riveted together. I encourage you to try, but don’t get a hernia doing it because it is tough. This leather is thick and these are big rivets. 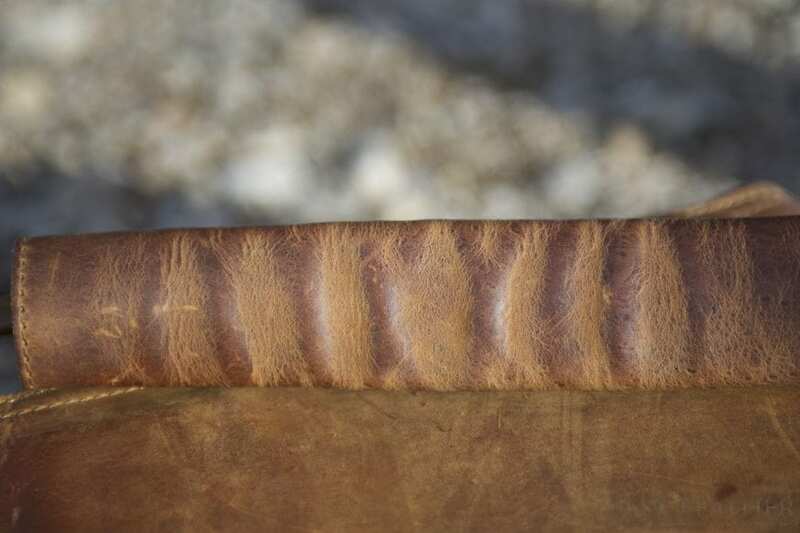 So I don’t know what the world’s going to look like in a hundred years but I think if any leather product that I’ve seen so far is capable of lasting a hundred years, it would be the Saddleback products because they’re pretty much just over-engineered. That’s ridiculous. They’re using high-quality thread here, they’re double-stitching it. I think they’re going to do a good job of lasting. They are using hollow rivets and that’s so that you can apply them more easily. They go on with a foot press and these aren’t solid rivets. I don’t think that’s going to be a strength issue. If you had a lot of sheer force on these rivets it might be an issue but it shouldn’t be an issue at all with these. It also makes it a little bit lighter. Lightness is kind of an issue. Once again, it goes to pros and cons. So if you want a really light bag, don’t get this bag. It’s 8.5 pounds or so which honestly I think is well worth the cost but carrying leather items there’s always pros and there’s cons. The pros are it looks really classy, it will last a long time, and you won’t need to buy a new item for very long. But the downside is you don’t want to get it stolen because the replacement cost is really high and it’s heavy and it can be a little bit bulky or awkward. You have to decide whether or not you want to put up with something like that in order to have a bag like this. So those are my first initial thoughts on the bag. I’ll be doing more as the coming weeks come up and hopefully you’ll enjoy it. So feel free to put comments and tell me what you’d like to see. If you have any suggestions on video editing or cinematography I’d love to hear them. 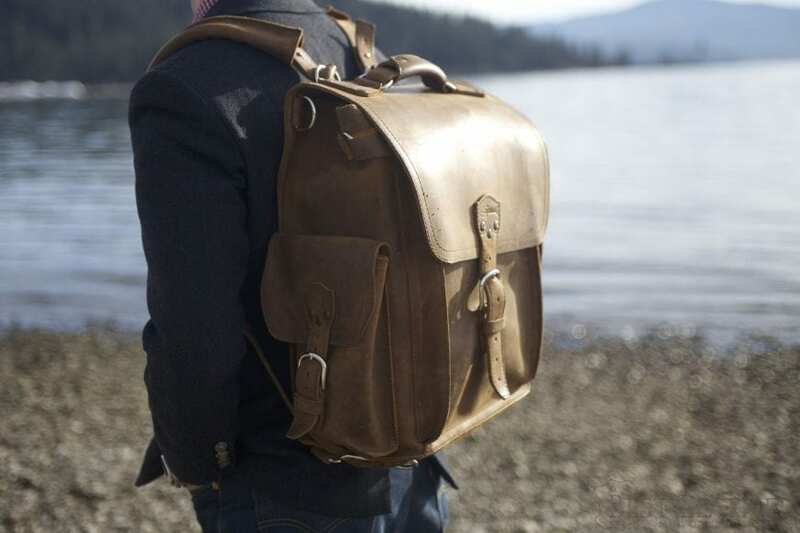 Continue to episode two of the Saddleback Leather Squared Backpack Review. 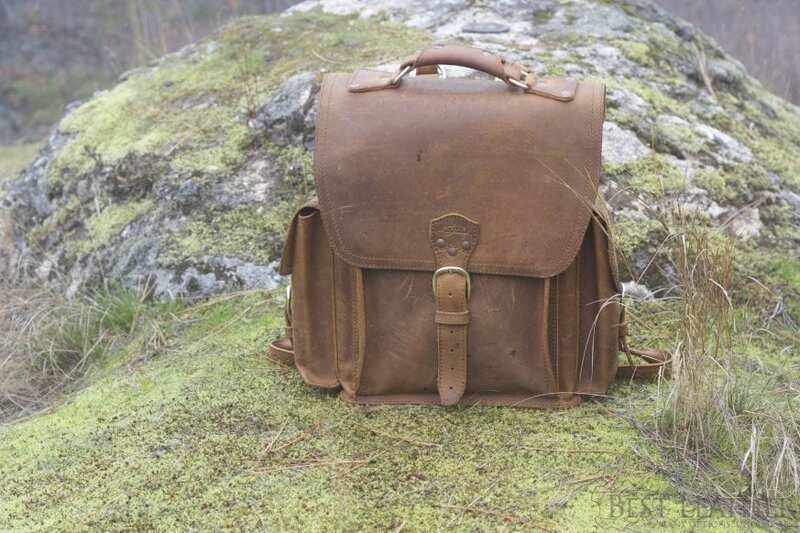 6 Comments on "Saddleback Leather Squared Backpack & New Tobacco Leather Review – Episode One"